Ascorbic acid (vitamin C) is an enzyme co-factor in eukaryotes that also plays a critical role in protecting photosynthetic eukaryotes against damaging reactive oxygen species derived from the chloroplast. Many animal lineages, including primates, have become ascorbate auxotrophs due to the loss of the terminal enzyme in their biosynthetic pathway, l-gulonolactone oxidase (GULO). The alternative pathways found in land plants and Euglena use a different terminal enzyme, l-galactonolactone dehydrogenase (GLDH). The evolutionary processes leading to these differing pathways and their contribution to the cellular roles of ascorbate remain unclear. Here we present molecular and biochemical evidence demonstrating that GULO was functionally replaced with GLDH in photosynthetic eukaryote lineages following plastid acquisition. GULO has therefore been lost repeatedly throughout eukaryote evolution. The formation of the alternative biosynthetic pathways in photosynthetic eukaryotes uncoupled ascorbate synthesis from hydrogen peroxide production and likely contributed to the rise of ascorbate as a major photoprotective antioxidant. Animals, plants, algae and other eukaryotic organisms all need vitamin C to enable many of their enzymes to work properly. Vitamin C also protects plant and algal cells from damage by molecules called reactive oxygen species (ROS), which can be produced when these cells harvest energy from sunlight in a process called photosynthesis. Photosynthesis occurs inside structures called chloroplasts, and has evolved on multiple occasions in eukaryotes when non-photosynthetic organisms acquired chloroplasts from other algae and then had to develop improved defences against ROS. There are several steps involved in the production of vitamin C. In many animals, an enzyme called GULO carries out the final step by converting a molecule known as an aldonolactone into vitamin C; this reaction also produces ROS as a waste product. The GULO enzyme is missing in humans, primates and some other groups of animals, so these organisms must get all the vitamin C they need from their diet. Plants and algae use a different enzyme—called GLDH—to make vitamin C from aldonolactone. GLDH is very similar to GULO, but it does not produce ROS as a waste product. It is not clear how the different pathways have evolved, or why some animals have lost the ability to make their own vitamin C.
Here, Wheeler et al. used genetics and biochemistry to investigate the evolutionary origins of vitamin C production in a variety of eukaryotic organisms. This investigation revealed that although GULO is missing from the insects and several other groups of animals, it is present in the sponges and many other eukaryotes. This suggests that GULO evolved in early eukaryotic organisms and has since been lost by the different groups of animals. On the other hand, GLDH is only found in plants and the other eukaryotes that can photosynthesize. Wheeler et al. 's findings suggest that GULO has been lost and replaced by GLDH in all plants and algae following their acquisition of chloroplasts. GDLH allows plants and algae to make vitamin C without also producing ROS, which could explain why vitamin C has been able to take on an extra role in these organisms. The results allow us to better understand the functions of vitamin C in photosynthetic organisms and the processes associated with the acquisition of chloroplasts during evolution. Ascorbate (vitamin C) plays an essential role in eukaryotes as an enzyme co-factor in hydroxylation reactions, contributing to diverse processes such as the synthesis of collagen and the demethylation of histones and nucleic acids (Mandl et al., 2009; Blaschke et al., 2013). Ascorbate also plays an antioxidant role in eukaryotes to help protect against reactive oxygen species (ROS) derived from metabolic activity. The majority of hydrogen peroxide (H2O2) generated in some organelles is likely reduced by other antioxidant systems, such as the peroxiredoxins and glutathione peroxidases in the mitochondria, and catalases in the peroxisome (Mhamdi et al., 2012; Sies, 2014). However, ascorbate plays an important role in protecting photosynthetic cells against ROS derived from the chloroplast (Smirnoff, 2011). Ascorbate peroxidase (APX), which is found in both the cytosol and the chloroplast of photosynthetic eukaryotes, is central to this photoprotective role. Thylakoid- and stroma-localised APX removes H2O2 produced by photosystem I through the activity of the ascorbate-glutathione cycle and this process may account for 10% of photosynthetic electron transport flow. Ascorbate also plays a critical role in preventing lipid peroxidation in the thylakoid membranes and acts as a co-factor for violaxanthin de-epoxidase in the xanthophyll cycle. In addition, ascorbate in the thylakoid lumen may prevent photoinhibition in high light by directly donating electrons to the photosynthetic electron transport chain (Smirnoff, 2011). These roles have been demonstrated in a range of ascorbate deficient plants that display sensitivity to high light and to oxidants (Smirnoff, 2011). Photosynthetic eukaryotes arose following the endosymbiotic acquisition of a cyanobacterial ancestor by a non-photosynthetic eukaryote in the Archaeplastida (Plantae) lineage (Keeling, 2010). Several other eukaryote lineages, including the diatoms, haptophytes and euglenids, subsequently gained plastids through a secondary endosymbiosis with either a red or green alga. These plastid endosymbioses were accompanied by lateral gene transfer on a massive scale from the symbiont to the host nuclear genome (known as endosymbiotic gene transfer or EGT), giving rise to the complex physiologies of photosynthetic eukaryotes (Timmis et al., 2004). The plastids in the major photosynthetic eukaryote lineages are all ultimately derived from the primary endosymbiosis. Whilst acquisition of a photosynthetic endosymbiont may have been beneficial to the host cell in many ways, the plastid is also a major source of potentially damaging ROS (Dorrell and Howe, 2012). There is evidence for extensive leakage of H2O2 out of plastids via aquaporins, particularly at high light intensities (Mubarakshina et al., 2010; Naydov et al., 2012). Plastid acquisition is therefore associated with a greatly increased requirement for cellular antioxidant systems to prevent photodamage. Cyanobacteria do not possess APX or any of the known enzymes for ascorbate biosynthesis and minimise photo-oxidative stress using alternative mechanisms, such as peroxiredoxins, catalases and glutathione peroxidases (Zámocký et al., 2010; Gest et al., 2013). This suggests that ascorbate was most likely recruited to its photoprotective role after the acquisition of the plastid in ancestral Archaeplastida (Gest et al., 2013), although the evolutionary origins of ascorbate biosynthesis are unclear. There is no clear evidence for ascorbate biosynthesis in prokaryotes (see ‘Materials and methods’), suggesting that the ability to synthesise ascorbate evolved in eukaryotes. The three eukaryote lineages in which ascorbate biosynthesis has been examined extensively (animals, plants and Euglena) all exhibit different biosynthetic pathways (Figure 1). These pathways may have arisen due to convergent evolution, or may represent modifications of an ancestral pathway. An understanding of these evolutionary relationships will provide insight into the cellular roles of ascorbate in eukaryotes, particularly in relation to plastid acquisition in the photosynthetic lineages. Major ascorbate biosynthetic pathways in eukaryotes. The scheme depicts the three major ascorbate biosynthetic pathways found in eukaryotes (Shigeoka et al., 1979; Wheeler et al., 1998; Linster and Van Schaftingen, 2007). The plant pathway (also known as the Smirnoff-Wheeler or D-mannose/l-galactose pathway) involves no inversion of the carbon chain (i.e., C1 of D-glucose becomes C1 of l-ascorbate), whereas the euglenid and animal pathways involve inversion of the carbon chain in the conversion from uronic acid to aldonolactone (i.e., C1 of D-glucose becomes C6 of l-ascorbate). Our analyses focus on enzymes with a dedicated role in ascorbate biosynthesis (shown in red): GULO—l-GulL oxidase; VTC2—GDP-l-galactose phosphorylase; VTC4—l-galactose-1-phosphate phosphatase; l-galDH—l-galactose dehydrogenase; GLDH—l-GalL dehydrogenase. The other enzymes are: PGM—phosphoglucomutase; UGP—UDP-D-glucose pyrophosphorylase; UGDH—UDP-D-glucose dehydrogenase; UGUR—UDP-glucuronidase; GlcUAR—D-glucuronate reductase; SMP30—regucalcin/lactonase; GAE—UDP-D-glucuronate-4-epimerase; GalUAR—D-galacturonate reductase. Enzyme names are not listed for steps where multiple enzymes may be involved or where specific enzymes have not been identified. Animals synthesise ascorbate via D-glucuronic acid and l-gulonolactone (l-GulL), with l-gulonolactone oxidase (GULO) catalysing the oxidation of l-GulL to ascorbate. Many animal lineages have lost the ability to synthesise ascorbate, including haplorhine primates, guinea pigs, teleost fish, some bats and passerine birds. In all of the animal ascorbate auxotrophs that have been examined, the gene encoding GULO is lost (Nishikimi et al., 1992, 1994; Cui et al., 2011a; Drouin et al., 2011). GULO uses molecular O2 as its electron acceptor, resulting in H2O2 production, which may have contributed to selective pressure to lose this enzyme in some animals (Bánhegyi et al., 1996; Mandl et al., 2009). The inability of many invertebrates to synthesise ascorbate led to early speculation that ascorbate synthesis may have evolved later in metazoan evolution (Chatterjee, 1973). However, whilst the loss of GULO in vertebrate lineages has been extensively examined (Yang, 2013), little is known about its distribution in invertebrates or the non-metazoan members of the holozoa. This information is required to identify the selective pressures underlying the evolution of ascorbate auxotrophy in animals. Two alternative routes to ascorbate biosynthesis have been identified in photosynthetic eukaryotes, which both employ l-galactonolactone dehydrogenase (GLDH) as the terminal enzyme instead of GULO. A pathway via D-galacturonic acid and l-galactonolactone (l-GalL) was identified in Euglena (Shigeoka et al., 1979). This pathway is analogous to the animal pathway and also appears to be functional in some stramenopile algae (Helsper et al., 1982; Grün and Loewus, 1984). In contrast, ascorbate biosynthesis in land plants was found to occur via a different route using D-mannose and l-galactose (Wheeler et al., 1998). Green algae also use the ‘plant pathway’ (Running et al., 2003; Urzica et al., 2012), but evidence is lacking for the nature of ascorbate biosynthesis in many other evolutionarily important lineages, most notably the rhodophytes (red algae). This paper focuses on the distribution of the three major pathways of ascorbate biosynthesis described above. Alternative routes of ascorbate biosynthesis have been described in trypanosomes and also in the fungi, which synthesise a range of ascorbate analogues (see ‘Materials and methods’) (Loewus, 1999; Logan et al., 2007). There is some evidence for the operation of alternative routes to ascorbate in land plants (Wolucka and Van Montagu, 2003; Lorence et al., 2004; Badejo et al., 2012), although molecular genetic evidence from Arabidopsis indicates that the D-mannose/l-galactose pathway is the primary route of ascorbate biosynthesis (see ‘Materials and methods’) (Conklin et al., 1999; Dowdle et al., 2007). The three major pathways of ascorbate biosynthesis therefore all utilise different routes to synthesise an aldonolactone precursor (l-gulonolactone, l-GulL or l-galactonolactone, l-GalL), which is converted to ascorbate by either GULO (animal pathway) or GLDH (plant and euglenid pathways) (Shigeoka et al., 1979; Wheeler et al., 1998; Loewus, 1999). GULO and GLDH exhibit significant sequence similarity and are both members of the vanillyl alcohol oxidase (VAO) family of flavoproteins (Leferink et al., 2008). These similar enzymes exhibit important biochemical differences. GULO can oxidise l-GulL and l-GalL, whereas GLDH is highly specific for l-GalL (Smirnoff, 2001). GULO localises to the lumen of the endoplasmic reticulum (ER), whereas GLDH is associated with complex I in the mitochondrial electron transport chain (Schertl et al., 2012). Importantly, GLDH does not generate H2O2, as it uses cytochrome c rather than O2 as an electron acceptor. Despite the importance of ascorbate in eukaryote physiology, it is not known how the different pathways of ascorbate biosynthesis arose in animals, plants and algae or relate to its differing cellular roles. This manuscript examines the origins of ascorbate biosynthesis in eukaryotes and seeks to address the following important gaps in our current knowledge: (1) what is the wider distribution of GULO loss and ascorbate auxotrophy in the metazoa? (2) do all photosynthetic eukaryotes use an alternative terminal enzyme to animals? (3) why do two different pathways using GLDH exist in photosynthetic eukaryotes? (4) which pathway is used in the rhodophytes? Using a combination of molecular and biochemical analyses, we present evidence that GULO is an ancestral gene in eukaryotes that has been functionally replaced by GLDH in the photosynthetic lineages, resulting in the development of their alternative biosynthetic pathways. To examine the origins of ascorbate biosynthesis in eukaryotes we analysed the distribution of GULO and GLDH in eukaryote genomes. We found that GULO and GLDH have a mutually exclusive distribution (Figure 2). GULO is absent from many metazoan genomes, including all insects, supporting earlier biochemical evidence that insects are predominately ascorbate auxotrophs (Supplementary file 1) (Chatterjee, 1973; Dadd, 1973). However, GULO is present in basally derived metazoans, including sponges and cnidarians, and is also present in a filasterean (Capsaspora owczarzaki) and in fungi (Supplementary file 1). This suggests that ascorbate synthesis via GULO is an ancestral trait in the Opisthokonta that has been lost in many lineages. Coulson plot indicating the taxonomic distribution of the different ascorbate pathways. 40 eukaryote genomes were analysed for the presence of genes in the ascorbate biosynthetic pathways. The two potential terminal enzymes in the pathway are boxed. GLDH is common to both the ‘plant’ and ‘euglenid’ type pathways. A schematic tree depicts the currently accepted phylogenetic relationships between organisms. The predicted route of ascorbate biosynthesis in each organism is shown. Note that ‘euglenid’ and ‘rhodophyte’ type pathways cannot currently be distinguished from sequence analysis alone and the predictions are based on biochemical evidence. Asterisk denotes a genome assembly was not available for Euglena gracilis and its transcriptome was analysed (‘Materials and methods’). Grey circles in VTC4 represent the presence of a highly similar enzyme, myo-inositol-1-phosphate phosphatase that exhibits l-galactose-1-phosphatase activity. GULO in trypanosomes and yeasts acts to oxidise the alternative substrates l-galactonolactone or D-arabinonolactone respectively. VTC3 is not a biosynthetic enzyme, but represents a dual function Ser/Thr protein kinase/protein phosphatase 2C that may play a regulatory role in the plant pathway (Conklin et al., 2013). Black cross represents a pseudogene encoding a non-functional enzyme. Organisms with sequenced genomes that were found to lack both of the terminal enzymes in the known pathways (GULO and GLDH) are likely to be ascorbate auxotrophs and were not included in the plot. These include Giardia intestinalis, Trichomonas vaginalis, Entamoeba invadens, Plasmodium falciparum and Perkinsus marinus. GULO is also present the Apusomonadida (Thecamonas trahens), a sister group to the Opisthokonts, and in members of the Amoebozoa and Excavata. Surprisingly, we also found GULO in basally derived Archaeplastida including the glaucophyte, Cyanophora paradoxa, and the rhodophytes Galdieria sulphuraria and Galdieria phlegrea. The glaucophytes occupy a key position in the evolution of photosynthetic eukaryotes as they diverged from the other Archaeplastida before the split of the red and green algal lineages and have highly unusual chloroplasts (termed cyanelles) that retain several features of the cyanobacterial endosymbiont (Price et al., 2012). GULO is absent from all other Archaeplastida genomes, although an enzyme family exhibiting weak similarity to GULO has been reported in Arabidopsis (Maruta et al., 2010). However, this enzyme forms a distinct phylogenetic clade from all other GULO and GLDH sequences and its role in de novo ascorbate biosynthesis remains unclear. GLDH was found in all Archaeplastida genomes, except for Cyanophora and Galdieria, and in all photosynthetic lineages that have acquired a plastid via secondary endosymbiosis (including stramenopiles, cryptophytes, haptophytes, chlorarachniophytes and euglenids). GLDH was present in several non-photosynthetic organisms including the oomycetes, the foraminifera and in the choanoflagellates, Monosiga brevicollis and Salpingoeca rosetta. The evolutionary history of algal plastids acquired by secondary endosymbiosis remains uncertain and there is some evidence that non-photosynthetic stramenopile (e.g., oomycetes) and rhizarian (e.g., foraminifera) lineages may have once acquired a plastid that was subsequently lost (Tyler et al., 2006; Keeling, 2010; Glöckner et al., 2014). 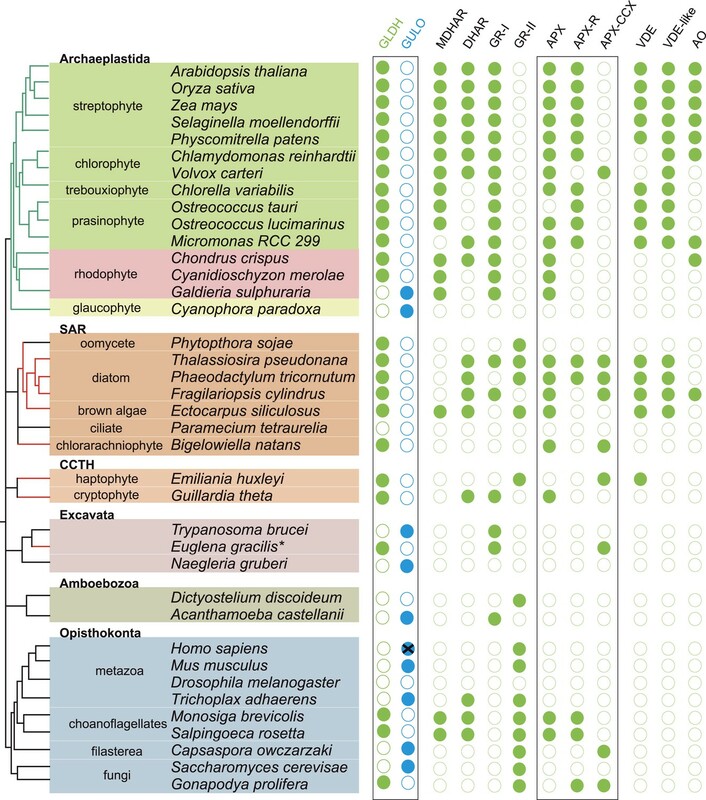 Further identification of GLDH or GULO in the transcriptomes of 165 eukaryotes within the Marine Microbial Eukaryote Trancriptome dataset (Keeling et al., 2014) confirmed that GLDH was found primarily in photosynthetic organisms (Supplementary file 2), but also in the non-photosynthetic stramenopiles such as oomycetes, biocosoecids and labryinthulids and in an acanthoecid choanoflagellate. The presence of GULO was restricted to non-photosynthetic organisms, including the heterotrophic flagellate Palpitomonas bilix, which is a non-photosynthetic relative of the Cryptophyte algae (Yabuki et al., 2014). The exception was the presence of GULO in the chromerids, Chromera velia and Vitrella brassicaformis, which are photosynthetic relatives of the Apicomplexa (Janouskovec et al., 2010). Further searches of Expressed Sequence Tag (EST) and Transcriptome Shotgun Assembly (TSA) databases identified a GULO sequence in the green alga, Chlorokybus atmophyticus (JO192417.1) (Leliaert et al., 2012; Timme et al., 2012). Chlorokybus represents a basal lineage in the charophyte algae, which are a sister group to the land plants (Figure 2—figure supplement 1). GLDH was identified in the other charophytes Klebsormidium flaccidum, Nitella mirabilis and Nitella hyalina (JO285109.1, JV744884.1, JO253095.1). These searches also revealed the presence of GULO in the craspedid choanoflagellate, Monosiga ovata (DC478225.1). The Craspedida subgroup of the choanoflagellates is divided into two major clades; clade I contains M. brevicollis and S. rosetta (which both possess GLDH) and clade II contains M. ovata (Jeuck et al., 2014). We conclude that nearly all photosynthetic eukaryotes use GLDH rather than GULO as the terminal enzyme in ascorbate biosynthesis. The exceptions are the basally derived Archaeplastida (Cyanophora, Galdieria and Chlorokybus) and the chromerids (Figure 2—figure supplement 2). No photosynthetic organisms were found to lack both GULO and GLDH, although both genes were absent in many non-photosynthetic organisms, including all insects, Daphnia, Paramecium and Dictyostelium. The genomes of many parasitic groups also appear to lack both enzymes including the diplomonads, parabasalids and apicomplexa (e.g., Giardia intestinalis, Trichomonas vaginalis and Plasmodium falciparum). Since all documented pathways of ascorbate biosynthesis require either GULO or GLDH, organisms lacking both of these enzymes are likely to be ascorbate auxotrophs (Chatterjee, 1973). A maximum likelihood tree of GULO and GLDH sequences was produced using the other members of the VAO family as an outgroup to root the tree. GLDH is highly conserved and the phylogenetic analyses strongly support a monophyletic origin for all GLDH sequences (100% bootstrap support, posterior probability = 1) (Figure 3). The monophyly of eukaryote GULO sequences is well supported (85% bootstrap support, posterior probability = 1). This clade includes trypanosome l-GalL oxidase and ascomycete D-arabinonolactone oxidase (Huh et al., 1994; Logan et al., 2007), indicating that although these enzymes exhibit altered substrate specificity they should be considered within the GULO clade for our evolutionary analyses. There is also moderate support for the monophyly of GULO and GLDH as a clade within the VAO family, supporting hypotheses that these enzymes may have originated from a gene duplication event. GLDH is highly unusual amongst the VAO flavoprotein family in that it does not use O2 as an electron acceptor, but mutation of a single highly conserved alanine residue in GLDH is required to convert it from a dehydrogenase to an oxidase (Leferink et al., 2009). The phylogenies within the GULO clade and the GLDH clade are poorly resolved, and so the trees do not provide evidence on the likelihood of lateral gene transfer, such as endosymbiotic gene transfer (EGT) or horizontal gene transfer (HGT), of either gene. Further phylogenetic analyses, individually examining each gene using unrooted trees with much greater taxonomic sampling, were unable to provide greater resolution (Figure 3—figure supplement 1). 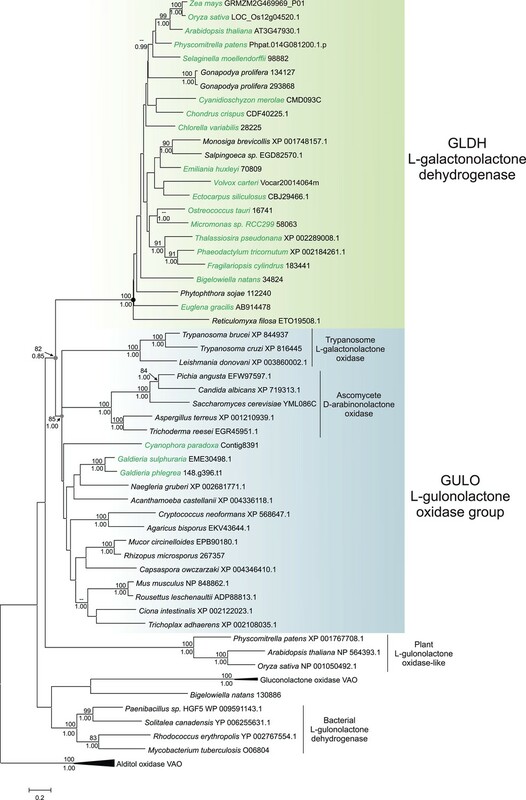 Phylogenetic analysis of l-gulonolactone oxidase and l-galactonolactone dehydrogenase. A maximum likelihood phylogenetic tree demonstrating the relationships between aldonolactone oxidoreductases involved in ascorbate biosynthesis. A multiple sequence alignment of 263 amino acid residues was used with alditol oxidases from the vanillyl alcohol oxidase (VAO) family acting as the outgroup. Photosynthetic organisms are shown in green. There is strong support for a monophyletic origin for GLDH in eukaryotes. Bootstrap values >80% are shown above nodes (100 bootstraps) and Bayesian posterior probabilities >0.95 are shown below (10000000 generations), except for selected key nodes (circled) where all values are displayed. Many of the enzymes preceding GULO or GLDH in the animal and euglenid pathways play other roles within the cell, for example, in uronic acid metabolism or providing pentose intermediates (Linster and Van Schaftingen, 2007). The presence or absence of these genes is therefore not solely related to ascorbate biosynthesis. However, the plant pathway of ascorbate biosynthesis contains a number of dedicated enzyme steps, allowing a much clearer examination of its distribution. This also enables a distinction to be made between the plant- and euglenid-type pathways, as both utilise GLDH as the terminal enzyme. 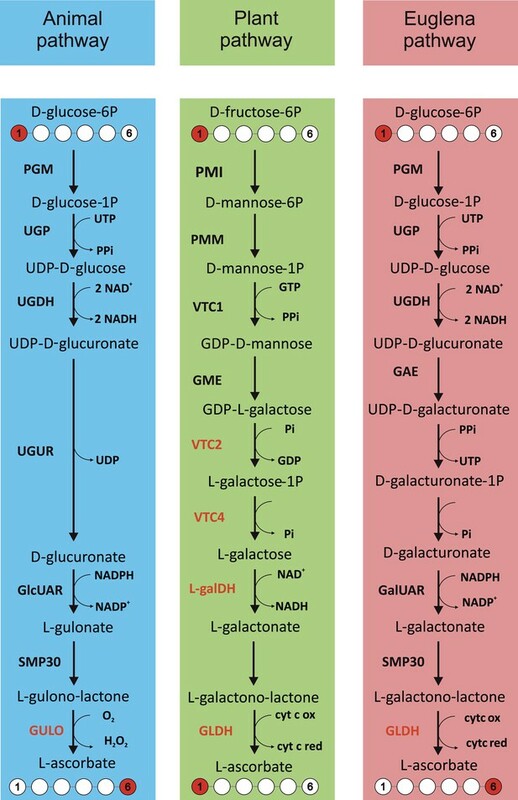 Plants and green algae use GDP-l-galactose phosphorylase (VTC2) and l-galactose dehydrogenase to generate l-GalL (Gatzek et al., 2002; Running et al., 2003; Dowdle et al., 2007; Laing et al., 2007; Linster et al., 2007), whereas euglenids use D-galacturonate reductase (Figure 1) (Ishikawa et al., 2006). We found that l-galactose dehydrogenase is present in all rhodophytes and Viridiplantae, except the prasinophytes Ostreococcus and Micromonas (see ‘Materials and methods’). Sequences exhibiting similarity to l-galactose dehydrogenase were also found in the diatoms and in some metazoa, but as some of these species are ascorbate auxotrophs, it appears that this enzyme may play alternative metabolic roles. VTC2 is found exclusively in the Viridiplantae (including Chlorokybus), indicating that the definitive ‘plant’ pathway is restricted to this lineage (Figure 2; Supplementary files 3, 4). Biochemical evidence from euglenids and stramenopiles (Shigeoka et al., 1979; Helsper et al., 1982; Grun and Loewus, 1984) suggests that organisms that lack VTC2 but possess GLDH are likely to operate a ‘euglenid’ pathway, with D-galacturonic acid acting as the precursor of l-GalL. However, it is not clear whether this is also the case in the rhodophytes. All rhodophytes possess a sequence that is highly similar to characterised l-galactose dehydrogenases from plants and bacteria (Gatzek et al., 2002; Hobbs et al., 2014) and l-galactose residues are a major constituent of red algal polysaccharides (Percival, 1979). We therefore examined whether rhodophytes could synthesise ascorbate via a modified ‘plant’ pathway using an alternative route to l-galactose. We used the macroalga, Porphyra umbilicalis, to examine whether rhodophytes can utilise l-galactose in ascorbate synthesis. We detected NAD+-dependent l-galactose dehydrogenase activity in Porphyra thallus extracts (Figure 4A). Feeding 10 mM l-galactose to Porphyra thallus slices increased the concentration of ascorbate (detected as dehydroascorbate by GC-MS) (Figure 4B). As red algae synthesise GDP-l-galactose from GDP-D-mannose (Su and Hassid, 1962), rhodophytes likely use a modified ‘plant pathway’ to synthesise ascorbate, employing an unidentified enzyme activity to generate l-galactose from GDP-l-galactose instead of VTC2. Biochemical evidence for a modified D-mannose/l-galactose pathway in rhodophytes. (A) Crude extracts of Porphyra umbilicalis thallus demonstrate l-galactose dehydrogenase activity using 5 mM l-galactose (l-Gal) as a substrate. No activity was demonstrated with 5 mM l-fucose (6-deoxy-l-galactose) as a substrate. The result is representative of three different enzyme preparations. (B) Feeding 10 mM l-Gal to Porphyra thallus for 24 hr resulted in an accumulation of ascorbate (detected as dehydroascorbate—DHA). D-mannose (10 mM) did not cause an increase in ascorbate in Porphyra, but exogenous D-mannose does not elevate ascorbate in land plants even though it is an intermediate in ascorbate biosynthesis. The bar chart shows mean peak areas of selected fragments (±s.d.). n = 3. (C) Feeding ascorbate precursors (25 mM) to Galdieria sulphararia from both the plant and animal pathways results in increased cellular ascorbate (detected as dehydroascorbate using GC-MS) (±s.d.). The extent of the increase in cellular ascorbate is influenced by the rate of conversion of the intermediate and the rate of its uptake into the cell. n = 3. (D) Feeding D-[1-13C]-glucose (25 mM) to Galdieria sulphararia results in enrichment of 13C in the 316/317 m/z fragment of dehydroascorbate (which includes C1), but not in the 245/246 m/z or 157/158 m/z fragment (which exclude C1) (±s.d.). In contrast, feeding D-[6-13C]-glucose (25 mM) labels all fragments, suggesting that they all include C6. In combination, this labelling pattern indicates plant-like non-inversion of the carbon chain in the conversion of hexoses to ascorbate. n = 3. We then examined ascorbate biosynthesis in Galdieria, which differs from all other rhodophytes (Supplementary file 4) in that it possesses GULO rather than GLDH. 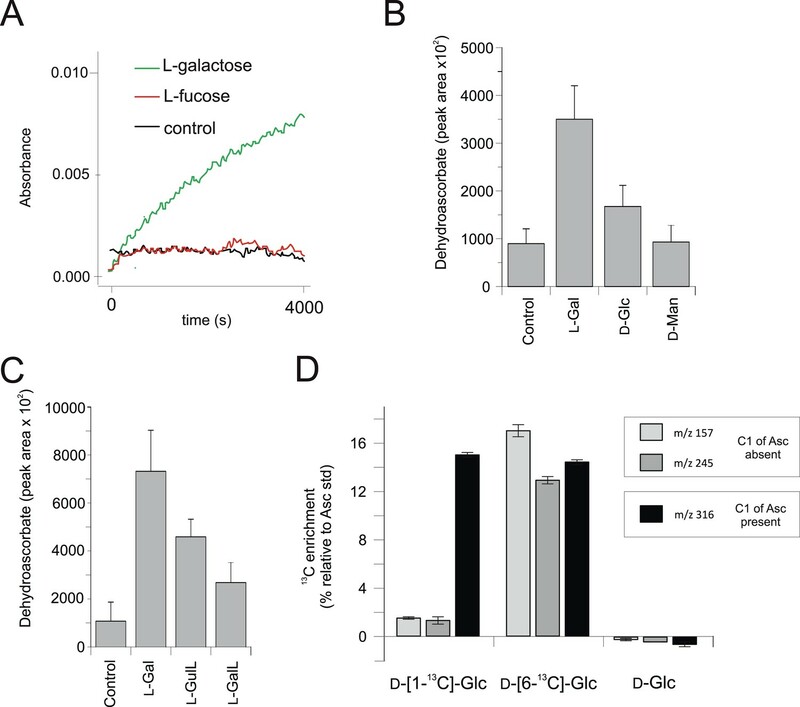 l-galactose, l-GalL and l-GulL were all effective precursors of ascorbate in G. sulphuraria (Figure 4C), suggesting that l-galactose is converted to l-GalL, which may then be converted to ascorbate by GULO. A positional isotopic labelling approach indicated that label from D-[1-13C]-glucose was incorporated primarily into carbon 1 (C1) of ascorbate (Figure 4D, Figure 4—figure supplement 1). This labelling pattern is expected for the plant pathway, while the reduction of a uronic acid intermediate in the animal or euglenid pathways would result in the transfer of label from C1 of glucose into C6 of ascorbate/dehydroascorbate (Loewus, 1999). G. sulphuraria therefore uses a similar pathway to other rhodophytes, employing GULO instead of GLDH. In combination, these data identify a clear difference between the Archaeplastida and the photosynthetic lineages that have acquired a plastid via secondary endosymbiosis. Whilst both groups use GLDH as the terminal enzyme for ascorbate synthesis, they differ in the route to l-GalL, The Archaeplastida generate l-GalL via l-galactose (without inversion of the carbon chain of glucose), whereas photosynthetic eukaryotes with secondary plastids synthesise l-GalL via D-galacturonate, resulting in inversion of the carbon chain. We have found that nearly all photosynthetic eukaryotes use GLDH to synthesise ascorbate, suggesting that this distribution may be linked to the photoprotective role of ascorbate. We therefore determined the distribution of ascorbate-dependent antioxidant mechanisms in eukaryote genomes. Three main isoforms of APX are found in eukaryotes (APX, APX-R and APX-CCX, a hybrid enzyme containing both ascorbate and cytochrome c peroxidase domains) (Zamocky et al., 2010; Lazzarotto et al., 2011; Fawal et al., 2013). APX and APX-R are found in nearly all photosynthetic eukaryotes and in the choanoflagellates, M. brevicollis and S. rosetta. Euglena and Emiliania do not possess APX or APX-R, although both possess APX-CCX, which is also found in some fungi and in Capsaspora (Figure 5). The only photosynthetic eukaryote in this analysis that lacks any isoform of APX was C. paradoxa. Cyanophora also lacks all of the remaining enzymes of the plant ascorbate-glutathione cycle: monodehydroascorbate reductase (MDHAR), dehydroascorbate reductase (DHAR) and glutathione reductase (GR). The ascorbate-dependent xanthophyll cycle is not present in glaucophytes and so Cyanophora does not require ascorbate for non-photochemical quenching (Figure 5). Moreover, the cellular concentration of ascorbate in Cyanophora is either very low or absent, as we could not detect ascorbate in Cyanophora extracts using GC-MS (data not shown). It is possible that ascorbate analogues are present that we could not identify. However, in combination with the lack of the plant ascorbate-glutathione cycle and the xanthophyll cycle, we conclude that Cyanophora is unlikely to rely on ascorbate to detoxify peroxides derived from photosynthesis. Cyanophora does however contain several glutathione peroxidases, peroxiredoxins and catalase, as well as a unique peroxidase (symerythrin) similar to rubrerythrin of prokaryotes (Cooley et al., 2011). These data suggest that glaucophytes rely on alternative mechanisms to detoxify peroxides derived from photosynthesis. As cyanobacteria also do not appear to use ascorbate for photoprotection (Bernroitner et al., 2009; Latifi et al., 2009), the photoprotective role of ascorbate may therefore have emerged in the Archaeplastida after the divergence of the glaucophytes. Coulson plot showing the distribution of photoprotective ascorbate-dependent enzymes. Eukaryote genomes were analysed for the presence of enzymes from the plant ascorbate-glutathione cycle, the xanthophyll cycle and other ascorbate-dependent enzymes. We found that eukaryotes possess two distinct isoforms of GSH reductase. PeroxiBase was used to distinguish between the different forms of ascorbate peroxidase (Fawal et al., 2013). Boxes highlight the terminal enzymes in the biosynthetic pathway and the ascorbate peroxidase family (APX, APX-R and APX-CCX). MDHAR—monodehydroascorbate reductase; DHAR—dehydroascorbate reductase; GR-I—glutathione reductase isoform I; GR-II—glutathione reductase isoform II; APX—ascorbate peroxidase; APX-R—ascorbate peroxidase-related; APX-CCX—hybrid ascorbate peroxidase/cytochrome c peroxidase; VDE—violaxanthin de-epoxidase; VDE-like—violaxanthin de-epoxidase like; AO—ascorbate oxidase. Ascorbate (vitamin C) is a very familiar metabolite to humans, so it is perhaps surprising that so many aspects of its biosynthesis and metabolism remain uncharacterised. The biosynthetic pathway of ascorbate in plants, which supplies the vast majority of ascorbate in the human diet, remained elusive for many years (Wheeler et al., 1998) and the major role of ascorbate in DNA demethylation emerged only very recently (Blaschke et al., 2013). In order to better understand the cellular roles of ascorbate, we have examined the distribution of the three major pathways of ascorbate biosynthesis in eukaryotes. We identify that the Opisthonkonts (animals and fungi), the Amoebozoa and the non-photosynthetic representatives of the Excavata and CCTH (Hacrobia) use GULO for ascorbate biosynthesis. In contrast, the photosynthetic organisms in the Archaeplastida, CCTH (Hacrobia), SAR and the photosynthetic members of the Excavata (euglenids) use GLDH. In these photosynthetic organisms, the combination of molecular and biochemical evidence suggests that the non-inversion pathway via L-galactose (plant pathway) is restricted to Archaeplastida, whereas the inversion pathway via D-galacturonate (euglenid pathway) is used by photosynthetic eukaryotes that acquired plastids via secondary endosymbiosis. The important exceptions to these trends are: firstly, that GLDH is found in several non-photosynthetic organisms, notably in some choanoflagellates (Opisthokonts) and stramenopiles and secondly, that GULO is found in several basally derived members of the Archaeplastida. The processes underlying the distribution of the different terminal enzymes are therefore central to our understanding of the evolution of ascorbate biosynthesis. The mutually exclusive distribution of two highly conserved and functionally similar genes in eukaryotes may be explained by either of two evolutionary scenarios: an ancient gene duplication in the last common eukaryote ancestor (ancient paralogy) followed by differential loss of either gene, or lateral gene transfer of a novel gene followed by functional replacement of the ancestral gene (Keeling and Inagaki, 2004). It is likely that one of these evolutionary scenarios underlies the distribution of GULO and GLDH amongst eukaryotes (Figure 6). Evolutionary scenarios for GULO and GLDH. The scheme illustrates two most likely evolutionary scenarios responsible for the distribution of GULO and GLDH in eukaryotes. In the ancient paralogy scenario, an ancient gene duplication in the last common eukaryote ancestor results in the presence of two functionally similar genes, GULO and GLDH, followed by differential loss of either gene in each lineage. 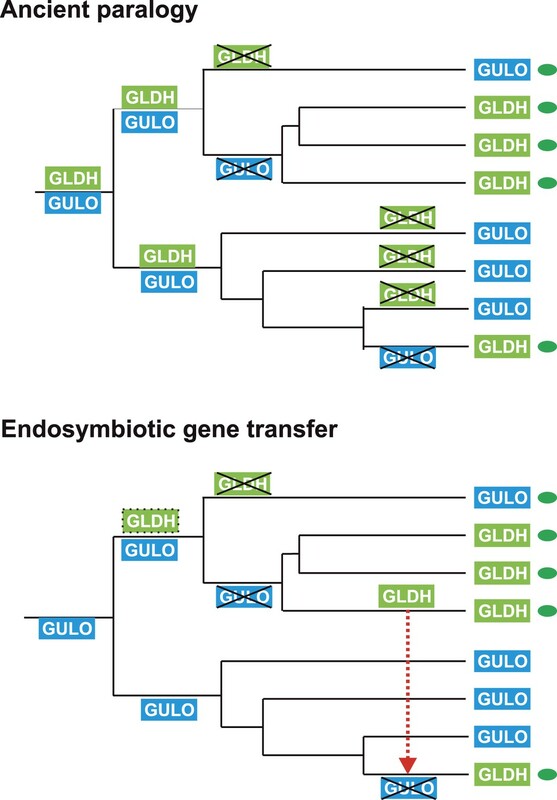 In the endosymbiotic gene transfer (EGT) scenario, GULO represents the ancestral gene and GLDH represents a novel gene that arose in a specific lineage. EGT of GLDH (red dashed arrow) to other photosynthetic lineages (green ovals) enables functional replacement of the ancestral gene. Note that GULO represents an ancestral gene in both of these evolutionary scenarios. The model of ancient paralogy requires that both genes were present in the last common eukaryote ancestor, where they both presumably contributed to ascorbate biosynthesis, and were then differentially lost by every eukaryote lineage. This requires that these two functionally similar enzymes co-existed in multiple lineages throughout eukaryote evolution without significant functional divergence. The distribution of GULO and GLDH in the Archaeplastida and in the choanoflagellates suggests that these enzymes may have coexisted for a time in these lineages (Figure 2—figure supplement 1). However, there are no clear examples of extant eukaryotes that possess both enzymes, which would be expected if they have co-existed extensively throughout eukaryote evolution. The ancient paralogy model also requires extensive loss of both GULO and GLDH. There is clear evidence for multiple independent losses of GULO in animals and indications that GULO activity may be deleterious under certain conditions, providing a potential selective pressure for gene loss (Bánhegyi et al., 1996; Hiller et al., 2012). Similar evidence for the loss of GLDH in eukaryotes is lacking. In addition, Arabidopsis mutants that lack GLDH cannot correctly assemble mitochondrial complex I (Pineau et al., 2008), suggesting that loss of GLDH is likely to have many wider impacts on metabolism. The broad distribution of GULO supports an ancient evolutionary origin for this gene. It is present in all of the eukaryote supergroups, including basally-derived lineages within the CCTH (Hacrobia) and Archaeplastida and also in the Apusomonads. Although GLDH is also present in most of the eukaryote supergroups (except the Amoebozoa), its distribution is primarily restricted to lineages that have acquired a plastid or to isolated lineages (e.g., choanoflagellates). Whilst we cannot discount an ancient origin for GLDH in the last common eukaryote ancestor, its distribution may also be reasonably explained by the lateral gene transfer model. In the lateral gene transfer scenario, either GULO or GLDH could represent a novel gene that arose in a specific lineage and was then acquired by other eukaryotes through horizontal gene transfer (HGT) or endosymbiotic gene transfer (EGT). However, the distribution of GULO cannot be reasonably explained by lateral gene transfer, as this requires HGT on a massive scale specifically into non-photosynthetic eukaryotes. In contrast, the distribution of GLDH can be largely explained by EGT during plastid acquisition. GLDH may have arisen specifically in ancestral Archaeplastida after the divergence of the glaucophytes and functionally replaced the ancestral gene (GULO). GLDH could then have been transferred to the other photosynthetic lineages via EGT, resulting in the replacement of GULO in lineages that acquired their plastids via secondary endosymbiosis (Figure 7). The presence of GLDH in some non-photosynthetic eukaryotes may be explained by the evolutionary acquisition of a plastid that was subsequently lost. For example, there is some evidence to support plastid loss in non-photosynthetic stramenopiles, although the number and timing of plastid acquisition events via secondary endosymbiosis remains a subject of significant debate (Keeling, 2010). The choanoflagellates have not acquired a plastid at any stage, but there is evidence for large scale horizontal gene transfer (HGT) from algae into this lineage, including the HGT of APX (Nedelcu et al., 2008). Choanoflagellates may therefore have acquired GLDH via HGT along with these other algal genes. EGT of GLDH is a more parsimonious scenario than ancient paralogy, as it requires fewer independent loss events. However, the poor resolution of the phylogenies within the GLDH clade means that direct evidence for either EGT or HGT between lineages is lacking. A proposed evolutionary model of ascorbate biosynthesis. The scheme illustrates the proposed events in the EGT evolutionary model of eukaryote ascorbate biosynthesis. In this scenario, ancestral eukaryotes synthesised ascorbate via GULO. GLDH arose in the Archaeplastida following primary endosymbiosis of a cyanobacterium, after the divergence of the glaucophyte lineage. GLDH functionally replaced GULO in the red and green algal lineages, coinciding with the rise of the photoprotective role of ascorbate. Plastid acquisition via secondary endosymbiosis of either a green or red alga resulted in endosymbiotic gene transfer of GLDH and replacement of GULO. As these organisms became the dominant primary producers in many ecosystems, a series of trophic interactions (dotted lines) resulted in the loss of GULO in non-photosynthetic organisms, either by providing a ready supply of dietary ascorbate (resulting in ascorbate auxotrophy in heterotrophic organisms) or through putative horizontal gene transfer of GLDH (e.g., choanoflagellates). For clarity, not all potential trophic interactions are shown. Both the ancient paralogy and EGT evolutionary scenarios are plausible in the wider context of ascorbate biosynthesis. 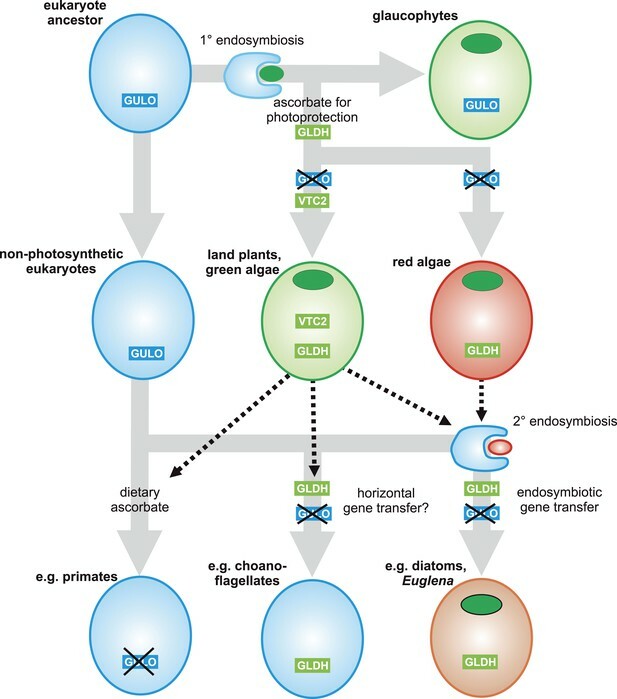 However, the EGT scenario provides a clear rationale to explain why photosynthetic eukaryotes with primary plastids exhibit a different pathway from those with secondary plastids. Our biochemical evidence suggests that ancestral Archaeplastida developed a non-inversion pathway via l-galactose that employed the broad specificity of GULO to oxidise l-GalL. The development of GLDH in ancestral Archaeplastida would have led to the eventual replacement of GULO in all red and green algal lineages, except Galdieria and Chlorokybus, resulting in the non-inversion plant-type pathway found in extant Archaeplastida. In the photosynthetic eukaryotes with secondary plastids, it is likely that the host initially synthesised ascorbate via an animal-type pathway (involving inversion of chain and GULO) and that the red or green algal symbiont used a plant-type pathway (involving non-inversion of the carbon chain and GLDH). However, neither pathway appears to operate in photosynthetic eukaryotes with secondary plastids, which instead use a euglenid-type pathway. We propose that EGT of GLDH from the symbiont could have resulted in functional replacement of GULO in the animal-type pathway of the host, leading to a hybrid biosynthetic pathway that employed D-galacturonate rather than D-glucuronate as an intermediate in order to provide l-GalL as a substrate for GLDH. The hybrid pathway therefore involves inversion of the carbon chain of D-glucose and GLDH. The generation of a hybrid pathway suggests that photosynthetic eukaryotes with secondary plastids only acquired GLDH by EGT rather than the entire plant pathway. In conclusion, the distribution of GULO and GLDH in eukaryotes may be explained by either of two evolutionary models; ancient paralogy followed by differential gene loss or EGT of GLDH followed by GULO loss. We favour the EGT scenario as the most parsimonious and the most consistent with the biochemical evidence, but we cannot rule out either scenario based on the current evidence. Therefore our evolutionary analyses do not allow us to definitively identify the origin of GLDH. However, they do enable clear conclusions to be made on the loss of GULO. Both evolutionary models support GULO as an ancestral gene in the last common eukaryote ancestor, indicating that GULO has been lost in almost all photosynthetic eukaryotes. Therefore, we can conclude that photosynthetic eukaryotes encountered strong selective pressure to replace the function of GULO in ascorbate biosynthesis. The critical role of ascorbate in photoprotection has been demonstrated in a diversity of photosynthetic eukaryotes, including land plants, green algae, diatoms and euglenids (Lavaud and Kroth, 2006; Ishikawa et al., 2010; Mellado et al., 2012; Urzica et al., 2012). Our analyses indicate that many photosynthetic eukaryotes possessed GULO prior to plastid acquisition, whereas almost all extant photosynthetic lineages use GLDH to synthesise ascorbate. The selective pressure to replace GULO in ascorbate biosynthesis following plastid acquisition could therefore be linked to the photoprotective role of ascorbate. One intriguing possibility is that the production of H2O2 by GULO may have limited the ability of the host cell to protect itself against ROS derived from the chloroplast. Ancestral eukaryotes developed multiple antioxidant mechanisms to protect themselves from ROS derived from organelles such as the peroxisome and the mitochondria. However, the acquisition of a photosynthetic cyanobacterial endosymbiont in the Archaeplastida would have resulted in a greatly increased requirement for cellular antioxidants to protect the host cell from H2O2 secreted by the plastid. Ascorbate, synthesised in the host cell but not in the cyanobacterial endosymbiont, appears to have been recruited to this role after the divergence of the glaucophytes. The recruitment of ascorbate as a major cellular antioxidant in photosynthetic eukaryotes may have led to an increased requirement for ascorbate biosynthesis. However, ascorbate biosynthesis via GULO results in the production of H2O2 in the ER lumen. In mammalian cells, this results in a damaging depletion and oxidation of the glutathione pool when ascorbate synthesis is increased by feeding l-GulL (Bánhegyi et al., 1996; Puskás et al., 1998). Ancestral photosynthetic eukaryotes may have been unable to balance their increasing requirements for ascorbate biosynthesis with maintenance of the redox status within the ER, providing selective pressure to uncouple ascorbate biosynthesis from H2O2 production. This hypothesis is consistent with the presence of GULO rather than GLDH in the glaucophytes. As glaucophytes do not appear to use ascorbate for photoprotection, ascorbate biosynthesis would not have been subjected to the same selective pressures as other photosynthetic eukaryotes. This rationale may also apply to the retention of GULO in Galdieria, which is likely to have both possessed both GULO and GLDH. Galdieria is photosynthetic and expresses a functional APX (Sano et al., 2001), but it is very sensitive to even moderate light intensities and grows primarily in an endolithic environment utilising heterotrophic carbon sources (Oesterhelt et al., 2007). Thus, photo-oxidative stress in this environment may be minimal, reducing the selective pressure in Galdieria to replace GULO. The evolution of vitamin auxotrophy underpins many important nutritional and ecological interactions between organisms (Helliwell et al., 2013). The selective pressures resulting in GULO loss in animals represent a combination of the costs of ascorbate synthesis (including detoxification of H2O2 derived from GULO), the physiological requirements for ascorbate and the ecological factors that determine the supply of dietary ascorbate throughout their life cycle. 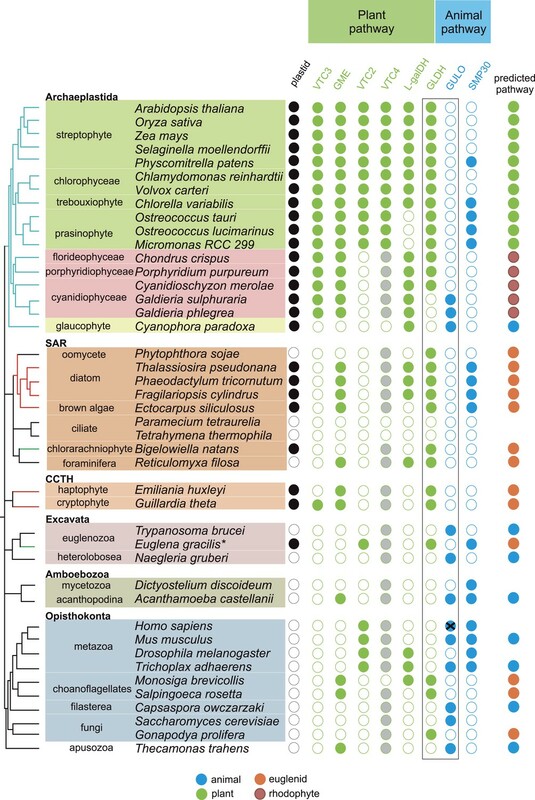 The development of the photoprotective role of ascorbate in photosynthetic eukaryotes would have significantly altered its availability to many heterotrophic organisms. The leaves of land plants have particularly high cellular concentrations of ascorbate relative to other photosynthetic eukaryotes (Gest et al., 2013), which may result from their inability to remove intracellular H2O2 via diffusion to an aquatic medium. Our dataset reveals that in almost all documented cases of ascorbate auxotrophy in animals, the major source of dietary ascorbate derives from GLDH rather than GULO (Table 1). This is the case even for insectivorous animals, as insects appear to lack GULO and must also obtain ascorbate in their diet, primarily from land plants. Thus, the replacement of GULO with GLDH in photosynthetic organisms may have ultimately been an important contributory factor in the loss of GULO in many animal auxotrophs. Major sources of dietary ascorbate were identified in known animal auxotrophs. This information allows us to assess which terminal enzyme contributed to the production of dietary ascorbate. In nearly all cases the major source of dietary ascorbate is most likely to have been derived from GLDH. Phylogenetic analyses suggest GULO has been lost on multiple independent occasions throughout the Chiroptera (bats). Although ancestral bats may have been primarily insectivores, various sources of dietary ascorbate may have contributed to GULO loss. The passerine birds that are unable to synthesise ascorbate are primarily herbivores or insectivores. However, some members of the Lanius genus (shrikes) feed also on small vertebrates, in addition to insects. Most teleost fish are believed to be ascorbate auxotrophs due to loss of GULO. As zooplankton (primarily crustacea) are also ascorbate auxtrophs, phytoplankton are likely to be the ultimate source of dietary ascorbate. Reports suggest the ability of crustacea to synthesise ascorbate is either absent or very weak, although the taxonomic sampling and currently available genomic resources are limited. Most, but not all, phytophagous insects have a dietary requirement for ascorbate, and we did not find GULO in any insect genomes. Note also that some species of insect (e.g., cockroaches) may obtain ascorbate from eukaryote endosymbionts, which may allow them to survive on ascorbate-poor diets. The pseudogenisation of GULO in primates, bats and guinea pigs is one of the best known examples of evolutionary gene loss (Drouin et al., 2011). Through a wider analysis of ascorbate biosynthesis, we have identified that GULO has also been lost in photosynthetic eukaryotes. Photosynthetic eukaryotes functionally replaced GULO with an alternative terminal enzyme, GLDH, which uncoupled ascorbate biosynthesis from H2O2 production and potentially aided the important photoprotective role of ascorbate. These developments in photosynthetic eukaryotes may have ultimately contributed to the loss of GULO in many herbivorous animals, by influencing their supply of dietary ascorbate. A broad range of eukaryote genomes were selected for detailed analyses (Supplementary file 5). Sequence similarity searches were used to identify candidate genes involved in ascorbate biosynthesis. Genomic searches were initially performed using BLASTP with mouse or Arabidopsis proteins. All instances of protein absence were confirmed using TBLASTN against the genome with additional searches using sequences from closely related organisms. Sequence similarity searches of transcriptomic datasets were used to identify trends in the presence of ascorbate biosynthesis genes, but were not used to infer absence. Proteins recovered from sequence similarity searches were identified using a combination of BLAST score, manual inspection of conserved residues in multiple sequence alignments and their position in phylogenetic trees generated by both neighbour-joining and maximum likelihood method within the MEGA5 software package (Tamura et al., 2011). For detailed phylogenetic analysis of GULO and GLDH, multiple sequence alignments were generated using MUSCLE. Poorly aligned regions were removed by manual inspection and the alignments were further refined using GBLOCKS 0.91b to remove ambiguously aligned sites (Talavera and Castresana, 2007), resulting in an alignment of 263 amino acids. ProtTest (Abascal et al., 2005) was used to determine the best substitution model (WAG with gamma and invariant sites) (Whelan and Goldman, 2001). Maximum likelihood phylogenetic trees were generated using PhyML3.0 software with 100 bootstraps. Bayesian posterior probabilities were calculated using BEAST v1.8 (Drummond et al., 2012), running for 10,000,000 generations, with a burn-in of 1,000,000 generations. As the phylogenetic relationships within the GLDH clade were not well resolved, further unrooted phylogenetic analyses of GLDH were performed using an individual multiple sequence alignment to allow more positions to be used. Galdieria sulphararia 074G was grown in Galdieria Medium (GM) (CCCryo, Potsdam-Golm, Germany) at 30°C, light intensity 50 μmol m−2 s−1. Porphyra umbilicalis was collected from Maer Rocks, Exmouth, UK (50° 36′ 31.6′′ N 3° 23′ 27.0′′ W). l-Galactose dehydrogenase activity was measured in ammonium sulphate (50% saturation) precipitates of Porphyra thallus protein extracts (Gatzek et al., 2002). To determine the impact of exogenous precursors on ascorbate, Galdieria cultures or slices of Porphyra thallus were incubated with sugars or aldonic acid lactones (25 mM Galdieria, 10 mM Porphyra) for 24 hr in GM or artificial sea water (Instant Ocean, Aquarium Systems, Sarrebourg, France). Galdieria cultures (15 ml) were harvested by centrifugation and extracted with 0.5 ml 80% methanol containing 0.1% formic acid using sonication in the presence of glass beads. Porphyra thallus was powdered in liquid nitrogen followed by homogenisation in 80% methanol (0.1 g thallus in 0.5 ml extractant). Homogenates were centrifuged (10 min at 16,000×g, 4°C). Supernatants (100 µl) were dried into glass vials, methoximated trimethylsilyl derivatives were prepared (Lisec et al., 2006) and analysed by accurate mass GC-EI-qToF MS (Agilent 7200, Agilent Technologies, Santa Clara, CA, USA). Derivatives were injected (0.2–0.4 µl, 1/2 to 1/50 split ratio) onto a Zebron SemiVolatiles GC column (30 m analytical + 10 m guard length, 0.25 mm internal diameter, 0.25 µm film thickness, Phenomenex, Macclesfield, UK) using He carrier gas (1.2 ml min−1). Injector temperature was 250°C and column temperature program was 70°C for 4 min, followed by an increase to 310°C at 15°C/min. The column was held at the final temperature for 6 min. Compounds were fragmented at 70 eV and MS spectra were collected (50–600 amu at 5 spectra s−1). Ascorbate is oxidised to dehydroascorbate (DHA) during derivatisation and DHA was identified by co-chromatography and comparison of accurate mass spectra with an ascorbate standard. The position of stable isotope incorporation from [1-13C]-D-glucose and [6-13C]-D-glucose into ascorbate was identified using mass spectra obtained from injection of [1-13C]-ascorbate derivatives. C6 of DHA was found in fragments with m/z values of 157.046 and 245.1029, while m/z 316.1038 contained C1 and C6. 13C enrichment was assessed by the relative abundance of m + 1 for each fragment relative to the 12C ascorbate standard.13C-labelled compounds were obtained from Omicron Biochemicals (South Bend, IN, USA) and all other chemicals were from Sigma–Aldrich (Dorset, UK). Reverse transcriptase PCR was used to verify the expression of GULO in C. paradoxa (CCAP 981/1) and confirm its coding sequence. RNA was prepared using the TRIzol method (Invitrogen, Paisley, UK) from C. paradoxa cultures grown in standard medium (MWC), at 20°C, 16:8 light:dark, light intensity 50 µmol m−2 s−1. Reverse-transcriptase PCR was performed using a gene specific primer (GGAACTCCTCGAACTTGGGG) for reverse transcription, followed by amplification of a 1017 base pair region using the following PCR primers: GTCGCCCCTTCTGAGCATAG (forward) and CATGAGCGCGTCGAAGTCT (reverse). NCBI accession number KJ957823. Euglena gracilis (strain Z) was grown in Koren-Hutner medium (KH) under continuous illumination (24 μmol m−2 s−1) at 26°C. RNA was harvested by the TRIzol method and used to prepare cDNA. Paired end reads were generated by Illumina sequencing technology resulting in a total of 193,472,913 reads. De novo assembly was carried out using Trinity (Haas et al., 2013), followed by further clustering with TGICL (Pertea et al., 2003). The three major routes of ascorbate biosynthesis described in Figure 1 are well supported by biochemical and molecular evidence. However, there is some evidence to suggest that some classes of eukaryotes may use alternative routes to ascorbate or use multiple routes. These pathways are reviewed comprehensively elsewhere (Loewus, 1999; Smirnoff, 2000; Linster et al., 2007) but the implications for our findings are highlighted below. Ascorbate in land plants is synthesised predominately via a non-inversion pathway through GDP-D-mannose and l-galactose in which carbon atom 1 (C1) of the precursor hexose remains as C1 in ascorbate (Loewus and Jang, 1958; Loewus, 1999). Genetic evidence from a range of ascorbate-deficient Arabidopsis mutants indicates that the D-mannose/l-galactose pathway is the primary route of ascorbate biosynthesis (Conklin et al., 1999, 2006; Dowdle et al., 2007; Smirnoff, 2011). For example, Arabidopsis vtc2 vtc5 double mutants lacking GDP-l-Gal phosphorylase activity are not viable unless supplemented with ascorbate, suggesting no other route can supply sufficient ascorbate to rescue this defect (Dowdle et al., 2007). However, a number of other routes to ascorbate in plants have been proposed. Plants can potentially use D-galacturonate as an ascorbate precursor, and this alternative route may contribute to ascorbate synthesis in certain tissue types, such as fruits (Isherwood and Mapson, 1956; Badejo et al., 2012). GDP-l-gulose, formed during the activity of GDP-mannose epimerase in vitro (Wolucka and Van Montagu, 2003), could provide l-GulL, which could contribute to ascorbate synthesis via the GULO-like enzymes found in land plants (Maruta et al., 2010). Overexpression of Arabidopsis GULO-like genes in tobacco cell lines increased cellular ascorbate concentration in the presence of exogenous l-GulL (Maruta et al., 2010). Oxidation of myo-inositol is another potential source of l-GulL (Lorence et al., 2004; Lisko et al., 2013). However, more definitive biochemical and genetic evidence for these alternative pathways is required in order to assess whether these pathways contribute significantly to ascorbate biosynthesis in plants. The evidence for the alternative pathways is largely based on increased ascorbate production after ectopic expression of genes or addition of exogenous substrates. This approach leaves open the possibility that these pathways are not active in wild type plants. The critical experiments, in which the proposed enzymes are mutated or knocked out, have not been reported. Our evolutionary analyses indicate that GULO and GLDH co-existed in ancestral Archaeplastida, suggesting that multiple pathways of ascorbate biosynthesis were operational in these organisms. Whilst the ‘plant pathway’ via GLDH is clearly the primary biosynthetic route in extant land plants, the presence of minor alternative pathways such as those listed above may reflect this ancestry of shared pathways. The genomes of the prasinophyte algae Ostreococcus and Micromonas are unusual amongst the Viridiplantae in that they lack l-galactose dehydrogenase and GDP-mannose pyrophosphorylase (Urzica et al., 2012). However, it is likely that these prasinophytes can generate GDP-D-mannose, either through an unidentified alternative enzyme activity (as proposed in brown algae [Michel et al., 2010]) or through the transferase activity of VTC2. Furthermore, we identified l-fucose (6-deoxy-l-galactose) dehydrogenase in all Ostreococcus and Micromonas genomes. l-fucose dehydrogenase also exhibits activity with l-galactose (Schachter et al., 1969) and it therefore may functionally replace l-galactose dehydrogenase in these prasinophytes. Analysis of the Marine Microbial Eukaryote Transcriptome dataset revealed that l-fucose dehydrogenase is present in many other prasinophytes including members of the Prasinococcales, Pycnococcaceae and the Pyramimonadaceae. The only prasinophyte identified with l-galactose dehydrogenase was Nephroselmis pyriformis (Nephroselmidophyceae). The Chlorodendrophyceae lineage containing Tetraselmis spp. also possess l-galactose dehydrogenase. GULO from trypanosomes exhibits activity with D-AraL or l-GalL but not l-GulL, and is therefore referred to as l-GalL oxidase (Wilkinson et al., 2005; Logan et al., 2007; Kudryashova et al., 2011). The source of l-GalL in trypanosomes has not been determined. We did not find evidence for l-galactose dehydrogenase or the other enzymes in the D-mannose/l-galactose pathway in trypanosome genomes. The fungi synthesise a range of ascorbate analogues, including 6-deoxy-l-ascorbate, ascorbate glycosides and the five carbon analogue, D-erythroascorbate (Loewus, 1999). Yeasts synthesise D-erythroascorbate from D-arabinose via D-AraL and these final steps are therefore analogous to the D-mannose/l-galactose pathway. Deletion of ALO1 encoding D-AraL oxidase in Saccharomyces cerevisiae results in increased sensitivity to oxidative stress but the mutants are still viable (Huh et al., 1994). Until both the biosynthesis and the physiological roles of these analogues are better understood, it is difficult to understand how the biosynthesis of the fungal ascorbate analogues may have evolved. There is little evidence to suggest that prokaryotes synthesise ascorbate de novo. GULO and GLDH are essentially absent from prokaryotes. Extensive sequence similarity searches identified a single GULO sequence in the cyanobacterium Rivularia sp PCC 7116 (WP_015122198.1), but all other cyanobacteria lack GULO. An enzyme exhibiting l-GulL dehydrogenase activity has been cloned from Mycobacterium tuberculosis and a similar enzyme is present in a range of other prokaryotes (Wolucka and Communi, 2006). While the presence of this enzyme suggests some prokaryotes have the capacity for ascorbate synthesis, specific evidence for in vivo ascorbate biosynthesis is lacking. There is a single report indicating that some cyanobacteria contain very low concentrations of ascorbate (Tel-Or et al., 1986), although the analytical method used (2,4-dinitrophenylhydrazine) may not be sufficiently specific for ascorbate at these concentrations (Roe, 1961). Prokaryotes lack ascorbate peroxidase and it is likely that early reports of ascorbate peroxidase activity in cyanobacteria were due to the activity of other forms of peroxidase (Bernroitner et al., 2009). The chromerids are photosynthetic relatives of the apicomplexa (Janouskovec et al., 2010) and are the only organisms in our analyses that have acquired a plastid via secondary endosymbiosis and retained GULO. C. velia utilises the xanthophyll cycle for non-photochemical quenching (Kotabová et al., 2011), suggesting that ascorbate performs a photoprotective role in chromerids by acting as a co-factor for violaxanthin de-epoxidase (VDE). We found homologues of VDE and VDE-like proteins in the C. velia transcriptome, as well as monodehydroascorbate reductase (MDHAR). The presence of GULO rather than GLDH in C. velia may relate to the unusual mitochondria of apicomplexans. Apicomplexans lack complex I of the mitochondrial electron transport chain (Danne et al., 2013), which may have influenced their ability to acquire and/or utilise GLDH, as GLDH is incorporated into complex I in land plants (Schertl et al., 2012). However, the genomes of the parasitic apicomplexa all appear to lack both GULO and GLDH. It should be noted that dinoflagellates also lack mitochondrial complex I but possess GLDH (Supplementary file 2). The Journal of Biological Chemistry 286:21511–21523. Journal of Experimental Botany 63:229–239. Journal of Experimental Botany 60:423–440. Journal of Experimental Botany 64:2793–2804. The Journal of Biological Chemistry 281:15662–15670. Proceedings of the National Academy of Sciences of USA 96:4198–4203. Journal of Molecular Biology 413:177–194. Molecular Biology and Evolution 28:1025–1031. Annual Review of Entomology 18:381–420. Canadian Journal of Fisheries and Aquatic Sciences 42:370–373. Journal of Cell Science 125:1865–1875. Ascorbate as seen through plant evolution: the rise of a successful molecule? Journal of Experimental Botany 64:33–53. Journal of Liquid Chromatography 13:357–370. European Journal of Biochemistry 225:1073–1079. Bioscience, Biotechnology, and Biochemistry 70:2720–2726. Proceedings of the National Academy of Sciences of USA 107:10949–10954. European Journal of Protistology 50:430–443. Philosophical Transactions of the Royal Society of London. Series B, Biological Sciences 365:729–748. Proceedings of the National Academy of Sciences of USA 101:15380–15385. Biochimica Et Biophysica Acta 1814:545–552. Proceedings of the National Academy of Sciences of USA 104:9534–9539. Plant & Cell Physiology 47:1010–1016. The Journal of Biological Chemistry 284:4392–4397. Archives of Biochemistry and Biophysics 474:292–301. Critical Reviews in Plant Sciences 31:1–46. The Journal of Biological Chemistry 282:18879–18885. Plant Physiology and Biochemistry 66:41–46. The Journal of Biological Chemistry 232:505–519. Bioscience, Biotechnology, and Biochemistry 74:1494–1497. Plant Physiology and Biochemistry 51:102–108. Archives of Biochemistry and Biophysics 525:181–194. Journal of Experimental Botany 61:3577–3587. Journal of Evolutionary Biology 21:1852–1860. The Journal of Biological Chemistry 269:13685–13688. The Journal of Biological Chemistry 267:21967–21972. The Journal of Biological Chemistry 283:32500–32505. The Journal of Biological Chemistry 236:1611–1613. Journal of Experimental Botany 54:1841–1849. Plant & Cell Physiology 42:433–440. The Journal of Biological Chemistry 244:4785–4792. The Journal of Biological Chemistry 287:14412–14419. Journal of Nutritional Science and Vitaminology 25:299–307. The Journal of Biological Chemistry 289:8735–8741. Philosophical Transactions of the Royal Society of London Series B, Biological Sciences 355:1455–1464. Advances in Botanical Research 59:107–177. Archives of Biochemistry and Biophysics 246:396–402. The Journal of Biological Chemistry 287:14234–14245. Proceedings of the National Academy of Sciences of USA 102:11645–11650. The Journal of Biological Chemistry 278:47483–47490. Journal of Applied Phycology 18:475–481. Archives of Biochemistry and Biophysics 500:45–57. Thank you for sending your work entitled “Evolution of alternative biosynthetic pathways for vitamin C following plastid acquisition in photosynthetic eukaryotes” for consideration at eLife. Your article has been favorably evaluated by Detlef Weigel (Senior editor), Joerg Bohlmann (Reviewing editor), and two reviewers. The external reviewers are recognized experts with complementary expertise in the areas of molecular evolution and metabolism. All reviewers were very positive about this paper and supported its publication in eLife, pending editorial revisions. This is a very strong paper on a very interesting topic, which provides fundamental new insights into the evolution of ascorbate metabolism. The paper presents a comprehensive cross kingdom analysis of the various pathways for ascorbate biosynthesis. It has clearly been diligently researched and is presented in a convincing manner, combining literature knowledge, the vast availability of gene sequences and select biochemical analysis. 1) The authors convincingly address questions 1, 2 and 4 which they set out in the Introduction at a high level. However, question 3 was not addressed adequately. This issue can be solved with editorial revisions, i.e. some rewriting. 2) Similarly, although the authors’ statements concerning ascorbate in Cyanophora are actually very careful and accurate, this paragraph should be slightly rephrased for clarity as it may be misunderstood as an overstatement of the results. In summary, all reviewers agreed that this is a very thorough and careful study which presents very interesting observations concerning the evolution of the biosynthesis responsible for synthesizing one of the most important vitamins in the biosphere. It provides considerable new insight and additionally will likely spur future research aimed at a comprehensive analysis of this important pathway. The paper is very well prepared and presented, and has been a pleasure to read. The EGT scenario of GLDH acquisition proposed in the manuscript provides a potential explanation for the distribution of the different pathways in photosynthetic eukaryotes. The Archaeplastida synthesise ascorbate via GLDH with no inversion of the carbon chain of D-glucose. EGT of GLDH into photosynthetic eukaryotes with secondary plastids would have enabled them to replace GULO in the animal pathway, resulting in a hybrid biosynthetic pathway in which ascorbate is synthesised via GLDH but with inversion of the carbon chain of D-glucose (i.e. the pathway first identified in Euglena). This provides an explanation for the observation that photosynthetic eukaryotes with primary plastids operate a plant-type pathway whilst those with secondary plastids operate euglenid-type pathway. We have amended the Results (in the subsection headed “Distribution of ascorbate-dependent antioxidant systems”) and the Discussion (in the subsection headed “Selective pressures underlying evolution of ascorbate biosynthesis”) to clarify this issue. We have carefully rephrased this paragraph (in the subsection headed “Distribution of ascorbate-dependent antioxidant systems”) to make it clear that our findings relate to the role of ascorbate in Cyanophora and that the role of ascorbate in cyanobacteria has been examined by previous researchers. The authors acknowledge funding from the Exeter University Science Strategy Fund, Biotechnology and Biological Sciences Research Council (BB/G021678) and the Natural Environment Research Council (NE/J021008/1). Hannah Florance (Exeter University Mass Spectrometry Facility) provided analytical assistance. The Euglena transcriptome was sequenced by the Exeter University Sequencing Service with assistance from Konrad Paszkiewicz and Karen Moore. Access to the Marine Microbial Eukaryote Transcriptome Sequencing Project (MMETSP) was provided by National Center for Genome Resources. This paper is dedicated to the memory of Frank A Loewus (1919–2014) who pioneered research into ascorbate biosynthesis. © 2015, Wheeler et al. The enzyme that catalyses the last step in the synthesis of ascorbate has been repeatedly lost and replaced during the evolution of the different kingdoms of eukaryotes.